Parkwest Fire Protection Ltd is one of the leading fire protection companies in the country. Building Ireland caught up with Managing Director Michael Curran Jnr to find out all about this family-run company. The Directors have in excess of 30 years’ experience in Fire Protection systems and procedures; they have undertaken contracts of all sizes and in all locations, including in the UK and Europe. Michael Curran Jnr co-founded the company in 2011 with his brother Conor, their father Michael Curran snr who himself has extensive experience in all aspects of fire proofing, and who currently works as a business consultant to the company. Michael and his brother Conor deal with the day to day running of the business both in terms of management of the contracts and being available to advise and consult on any current and/or proposed new development. It is important to them that all contracts are managed and completed on time and with the utmost care and they use whatever resources are available to them in order to achieve that objective. Working alongside architects, surveyors and third party mapping and planning companies, helps them to deliver a service that they believe is second to none and provides peace of mind to their clients. They currently employ 35 staff and in addition to providing fire protection services, Parkwest is one of the main installers of insulation and acoustic systems to most of the major construction companies in Ireland today. “We do a lot of work for large well-known companies such as Sisk, Bam, Rhatigan, MDY, Collen and Walls and we work closely with a number of companies that deal with management and maintenance of buildings, which often need upgrading to industry standards,” said Michael. “This is probably one of the busiest times we’ve seen in the last few years; we are passionate about what we do, and constantly review our systems and working practices to ensure we stay ahead of the game and continue to provide the best service we can – and this seems to be paying dividends for us. Parkwest Fire Protection Ltd has been a full member of the Association of Specialist Fire Protection Ireland since 2012. The firm works closely with the ASFP Group both in Ireland and England to ensure that projects are carried out and completed to the highest standard. In 2012, Parkwest Fire Protection Ltd became part of the FIRAS group when they were accepted as certified installers. All of their employees have been trained in the installation of Fire Protection. The company promotes correct installation of fire barriers and welcomes third party certification and random unannounced inspection of their work. “We were the main fire stopping contractor on the new Central Bank Building for Walls Construction – this was an 18-month project and upon conclusion, we were asked to continue working for Walls on a new project at the site next door – Dublin Landings. Clearly, the projects keep coming for Parkwest Fire Protection Ltd, so what’s the secret? How is it that their clients continue to come back time and again, despite there being many other contractors in the field of Fire Protection? Michael believes there are a number of reasons for this, some already identified elsewhere in this briefing but it is their commitment to quality that he feels is the most important factor and the reason why they have gained the great reputation in the business that they currently have. The staff at Parkwest carry safe pass cards, manual handling certs, MEWP tickets and are part of a recognised trade union while also being contributors to the CWPS. “We realise that the bottom line for most companies is often cost, and although we aim to be competitive, we will never compromise quality and service for price; in this day and age, especially when there is so much adverse publicity about buildings not having the correct level of fire protection in them and tragedies such as Grenfell Tower occurring as a consequence, it is more important to us than ever to ensure that our products and service are the best out there,” said Michael. Parkwest Fire Protection Ltd also continues to be one of the leading installers of all types of insulation, like soffit insulation, external wall insulation and attic insulation. The company also works very closely with manufactures and suppliers to make sure that clients get the products and the service they require. To ensure the complete building inspection and surveying system, Parkwest Fire Protection has been using Bolster Systems for the past 24 months now. Bolster Systems is App based and offers an electronic management solution which is designed to integrate the installation, documenting and management of fire barrier penetrations and fire-stopping within a building and ensures a permanent record of the installation. 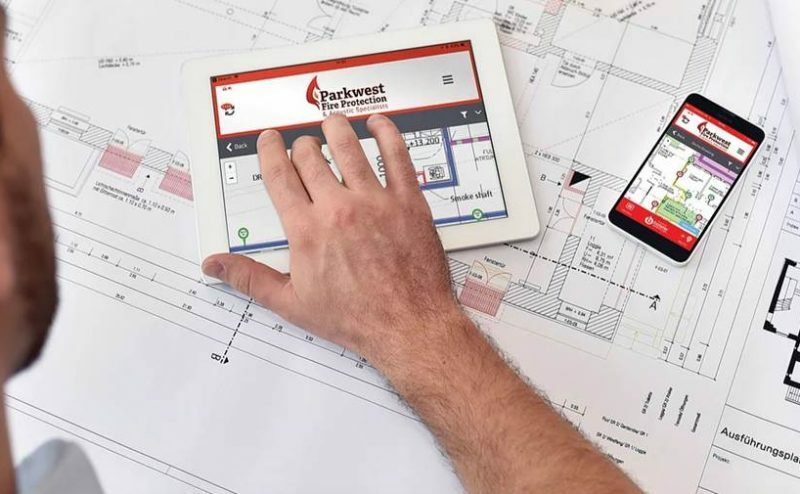 “Parkwest Fire Protection has been using this system for the last two years and it has revolutionised the way in which the company delivers important information relating to any installation that it is contracted to carry out. It has huge benefits and advantages for the client both in terms of access to data and time saving and we fully endorse it as the way forward for all fire protection projects in the future,” Michael concluded. You can learn more about the popular electronic management App at www.parkwestfireprotection.ie/app.